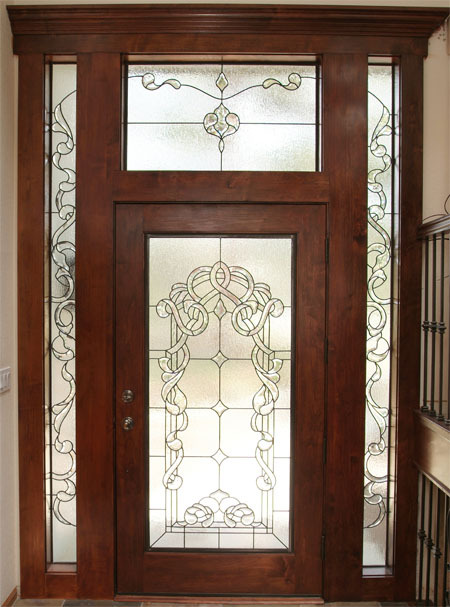 Even though we have many patterns of our beautiful stained glass art available to choose from, in fact every piece we do — whether for a window, a door, a transom, or a skylight — is custom made. No matter what size or shape your windows are, we can accommodate them. Did you know that although Scottish Stained Glass does traditional colored glass windows, 90% of our business is clear glass? One of the reasons it’s so popular is that it matches any decor, so if you decide to change your color scheme, or sell your home, the color of the glass does not get in the way of your plans. But whether you’d like vivid rich colors, muted earth tones, or simply texture, beveling and design with no color at all, our artists will create exactly what you are looking for. We are the largest custom stained glass studio in the country, employing talented artisans around the country. They enjoy the challenge of seeing your vision come to life. Even if you are interested in a traditional design, such as Celtic or Art Deco, you can still work with our designers to add your own unique flair to it. And when it comes to a contemporary design, let your imagination run wild. Custom glass is the perfect way to add value, beauty and a distinctive look to your home, one you will not tire of year after year. When people hear the word “custom” they immediately assume it will be exorbitant as well. At Scottish Stained Glass, nothing could be further from the truth. Our designers will work with you to find a custom design that fits within your budget. If you’re not in one of our office areas, we’ll consult with you through the miracle of phone, Internet and digital design and photography technologies. It’s simply amazing what we can do these days! After you choose your design, we will send you an exact computer rendering of what it will look like for your final approval. Read more about the step by step process we use to deliver beautiful stained glass windows to your home.